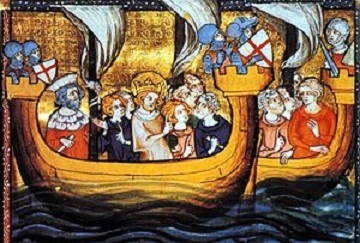 Sixth Crusade (1248-1254) - What I am referring to as the Sixth Crusade is actually historically remembered as the Seventh. However, the historical Sixth Crusade was so short and involved so little fighting (and more diplomacy), that many historians simply consider it an extension of the Fifth. And so, for the sake of space, I have bypassed Crusade 5½ and am moving on the next one. By the 13th century, Muslim power had largely shifted to Egypt. First under the Ayyubid Dynasty, founded by Saladin, and then the Mamluk Sultanate. About this time, another variable was also added to the equation; the Mongol Hoard. While the Mongol Empire never controlled the Holy Land, its conquests certainly had an impact there. Its displacement of the Khwarezmian Turks forced them into the region where they eventually took Jerusalem. And with the fall of Baghdad at the hands of the Mongols in 1258, Cairo became the most important center in Islam (until the rise of the Ottoman Empire). So once again, the Europeans reasoned that if Egypt could be taken, control of the Holy Land would be a simple matter. The Sixth (or Seventh) Crusade played out very similarly to the Fifth. King Louis IX of France was the only monarch who agreed to participate in this new Crusade; and so, he naturally was chosen to lead it. His army sailed for Egypt and captured Damietta in June 1249. In November he began his march on Cairo. Once again the flooding Nile slowed his army down (Those who fail to learn the lessons of History are doomed to repeat it). Louis divided his army and placed half of it under command of his brother, Robert of Artois. Accompanying Robert was a large contingent of Templars. They were defeated at the Battle of Mansurah in February 1250 and Robert was killed. This prompted Louis to retreat back to Damietta the following month. But once again, the Ayyubids attacked a retreating Crusader army and wiped it out at the Battle of Fariskur. Louis survived, but was taken captive. He was released after his kingdom paid a heavy ransom. Once again the invasion of Egypt ended in failure for the Crusaders.